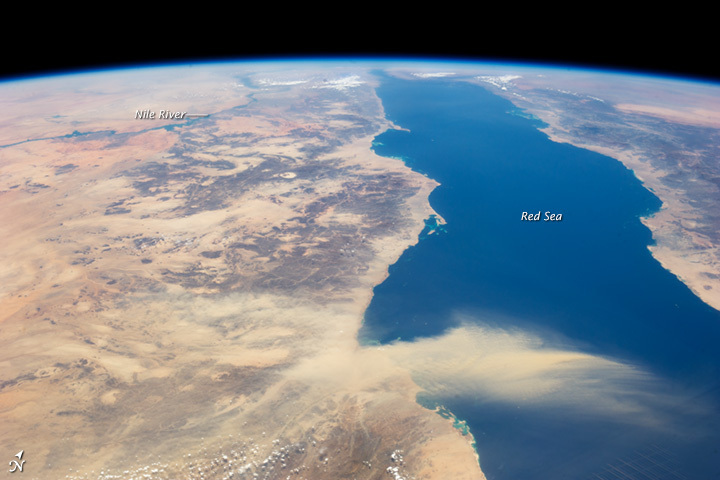 This astronaut photograph provides a panoramic view of most of the length of the Red Sea. The northernmost end, the Gulf of Suez, is just visible at the top center of the image and is fully 1,900 kilometers (1,200 miles) in ground distance from the International Space Station (ISS). The Nile River snakes its way northward through the Sahara Desert on the left. 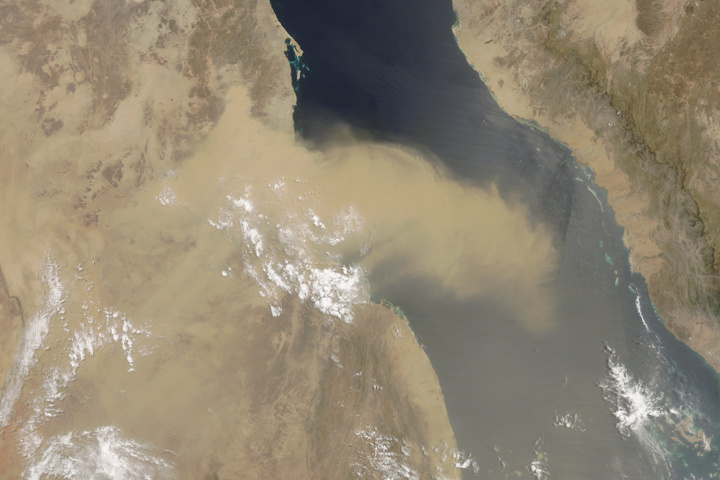 Much closer to the camera—but still more than 550 kilometers (340 miles) from the ISS—is a dust plume surging out over the Red Sea and reaching most of the way to Saudi Arabia. 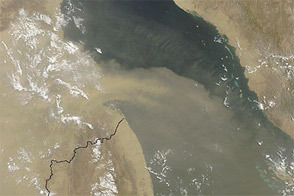 The point source of this plume is the delta of the southern Egyptian river Khor Baraka. Astronaut images have shown that this delta is a common source for dust plumes, mainly because it is a relatively large area of exposed, loose sand and clay that can be easily lofted into the air. 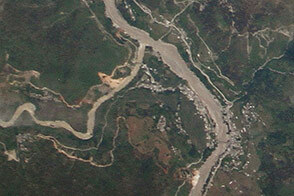 The river also cuts a narrow valley through a high range of hills that channels the wind, making it blow faster. 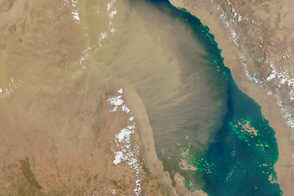 This dramatic view of the Red Sea shows the generally parallel margins of the opposing coastlines. The rift, or depression, that now holds the Red Sea has been opening slowly for about 30 million years and is nearly 300 kilometers (200 miles) wide in the region of the dust plume. The depression only began filling with seawater within the past five million years. The satisfyingly good fit between the coastlines allows the viewer to easily visualize how Africa and Arabia were once a single landmass before the Red Sea rift formed. Astronaut photograph ISS036-E-11050 was acquired on June 22, 2013, with a Nikon D3S digital camera using a 50 millimeter lens, and is provided by the ISS Crew Earth Observations experiment and Image Science & Analysis Laboratory, Johnson Space Center. 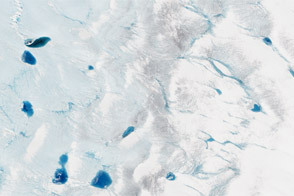 The image was taken by the Expedition 36 crew. It has been cropped and enhanced to improve contrast, and lens artifacts have been removed. The International Space Station Program supports the laboratory as part of the ISS National Lab to help astronauts take pictures of Earth that will be of the greatest value to scientists and the public, and to make those images freely available on the Internet. Additional images taken by astronauts and cosmonauts can be viewed at the NASA/JSC Gateway to Astronaut Photography of Earth. Caption by M. Justin Wilkinson, Jacobs/JETS at NASA-JSC. 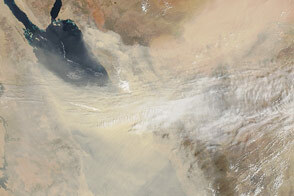 Airborne dust draws the eye to the place where Africa and Arabia once fit together.